M.C. Mary Kom, the ever shining star in India's boxing history has many tags to her name, such as Magnificent Mary, Mary Kom, the pride of India; Mary Kom, the shining star of the North East etc. But she is our own 'Darling of Manipur'. The other day when my two and a half years old grand- daughter insisted me to have some rounds of punches with her for a mock-fight in my bed, I came to realize that Mary Kom, the darling of Manipur has really become a legend in the annals of Indian sports. Once the legendary body-builder Maipak nicknamed as 'Maipak the Son of Manipur' after the much-acclaimed documentary film on his exemplary achievement was held so dear to the hearts of the Manipuris. After him, in terms of popularity graph, Nilakomol, the hockey player, Dingko, the boxer and Kunjarani, the weightlifter could reach unprecedented heights of fame. However the people of Manipur have showered so much love and affection to M.C. Mary Kom, unlike to any of her predecessors. No doubt her phenomenal success has deservingly earned her these accolades. However, as I believe, her humble origin – her background of a backward tribal community of Manipur (i.e. Kom) – has also duly contributed to our empathetic feeling of love and affection towards her, not to mention of her pleasing manner as a person. May be our own exhilaration about her ethnic origin has to do with the prevalent intellectual concerns widespread in the entire north-east India about the ethnically homogenous status of the region, which has a deep impact on many contemporary issues of the region, including emotional integration. Here, let me remember a remarkable incident that took place soon after the London Olympics-2012. In a book- release function at the Manipur Press Club, Imphal, the author of the poetry book, which was his maiden venture, chose to read out a few selected poems for the audience entitled "Manipurgi Maktraba Mangal Mary Kom', if I remember correctly. As a matter of fact, a poem on Mary Kom and her spectacular achievement did not come out as a big surprise to me, though it did delight everybody present there including myself. The reason is – as the date of London Olympics drew nearer and nearer, it had been almost a routine with the Meiteilon dailies to put up in their weekend literary columns some poems on the theme of 'Mary Kom'; the dazzling daughter of Manipur. These poems echoed the ardent wishes of the people of Manipur for her success in the forthcoming Olympics in London. I only regretted to think that most of our tribal brothers and sisters, including Mary Kom herself, did not possibly read these poems since they hardly go for Manipuri ( Meiteilon) newspapers. Today in the entire valley of Manipur 'Laishram Samarendra' is perhaps the most celebrated one amongst the living poets of Manipuri. This seventy-plus poet is also a distinguished prose writer. He writes a weekly column in one Manipuri daily, which is highly popular with the readers. He has written with gusto about young achievers in his peculiar style whereby he expresses his robust optimism in the potential of the younger generation, which he zealously calls 'the Brave New World'. To this end he has written over the years about AR Rahman, the ace young music composer, long before his Oscar, about sportspersons like Dingko and Kunjarani, about the young and dynamic parliamentarian Agatha Sangma, about singers like Angamla of Ukhrul, etc. etc. And recently about Mary Kom, the darling daughter of Manipur too, a couple of times. Here again our Chingmee brothers and sisters might have missed those write-ups of a celebrated personality like Laishram Samarendra, particularly the ones referring to Mary Kom's achievement which exemplifies the spirit of Manipuri women. As the countdown for London Olympics started, one evening I buttoned by chance on an ISTV Channel, and lo – there appeared Mary Kom on the screen, being interviewed by the Channel in front of a relatively small audience. The interviewer as well as the small congregation of her fans clearly showed their love and affection for this diminutive sports star from Manipur who has brought laurels to the country and due recognition to this tiny state. She has now become a symbol of 'New Woman' constantly inspiring the womenfolk of Manipur to go ahead. 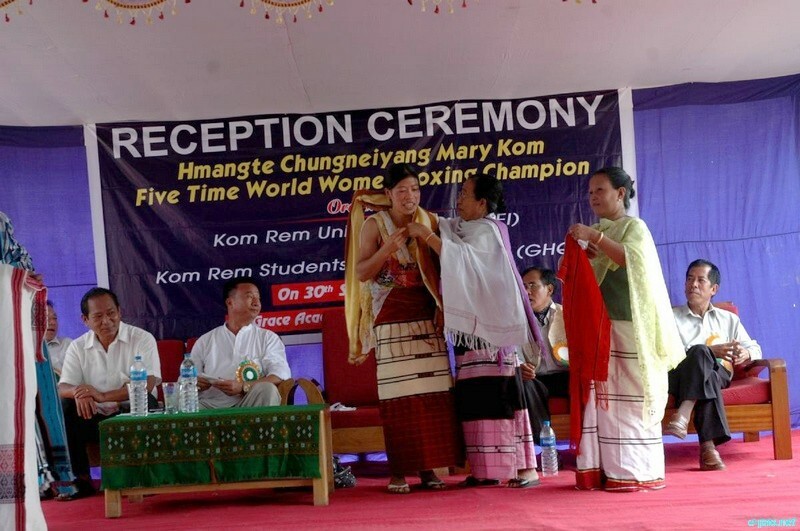 Viewers across the state must have enjoyed the programme mentioned above that showed them a Mary Kom in partially traditional attire of Kom community, presenting herself as an ordinary young lady with feminine grace, charm and modesty, thereby easily winning the hearts of her enormous fans with her coy smiles and straightforwardness. At one point she happily agreed to sing a gospel song in her own dialect. Wow! What a sweet voice and what a melodious tune! We were even more impressed when she revealed that she had already released audio cassettes to her own credit as a gospel singer years back. Truly magnificent, isn't it? Many many thanks to the ISTV for that lively show on Mary Kom. Yet another interesting episode – a memorable day I won't easily forget. On the 5th August, 2012 there was a special show of an important stage play at the JNM Dance Academy, Imphal. The play was directed by the promising young director Dr. (Miss) Thaninleima, an NSD (New Delhi) graduate. It is a customary practice in the theatre circle that at the end of a play, friends and admirers of the director and the artistes would get on to the stage to congratulate the director, the artistes and the technicians. Generally, they would cheerfully spend a few minutes on the stage discussing the play and leisurely talking about other things related with different aspects of performing arts. Likewise, outside the auditorium also some people would indulge in scholarly talks about contemporary theatre movements etc. This is a usual scene whenever there is a stage play in the city. But that day people excused themselves with impressive smiles and hasty handshakes with the director and they got disappeared in a hurried manner from the vicinity. The auditorium was empty within minutes. All the spectators' minds were seemingly preoccupied with something important that evening. Oh yes, the Semi Final between our Mary Kom and Poland's Karolina at around 6 pm in the ongoing London Olympics this evening! And everybody knew well that if Mary Kom emerged victorious in this Semi Final, her chance of gold is very near. Oh, God, help our Mary Kom – that was the silent prayer of everybody. I was driving away my two-wheeler faster than usual from the JNMDA Campus with a hope to get home before 6 pm and sit attentively before the T.V. in the drawing room. Out into the street I began to see that not only the spectators at the JNMDA but also everybody in the street were apparently in a hurry to get home before 6 pm for the sake of Mary Kom, the Olympian boxer of Manipur. One day, early in the morning I was reading the headlines in a local daily. The news item quoted MC Mary Kom who had reportedly attacked the media fraternity of Manipur and also blamed the Meitei community for being indifferent towards her on communal line. What nonsense! I cried. What a bloody distortion, I exclaimed. But in a few seconds I realized that something was wrong somewhere. 'Wait and see, anyway. Don't worry. And relax', I told myself assuredly. Mary Kom, who is a God-fearing person, can never say such things against her will - that was my belief. That morning, I simply remembered how seriously and dutifully our local dailies, both English and Manipuri, projected Mary Kom along with other Olympians as promising contestants in the London Olympics, 2012. I particularly remembered the impressive job that Hueiyen Lanpao (English) had done by publishing more than seventy messages from Mary Kom's fans for two consecutive days i.e. on the 8th and 9th August, 2012. Her fans (most of them Meiteis) congratulated her on winning bronze medal in the Olympics, encouraging her to do better next time for gold, and in the second day (9th August) too still congratulating and consoling her by telling her not to lose heart after having failed to enter the Final this time but still look forward to Rio Olympics – 2012 with peoples' blessings. One Meeteilon daily even carried a photo that showed Mary Kom's family members sitting anxiously before the TV set. A good catch, indeed. We, the Manipuris live in a small state; we manage things with small budgets and we plan things in a small scale. In such a place what the electronic and print media in Imphal did for Mary Kom is really great. Today we are happy. Sunshine after the gloomy cloud. Warm and bright! The controversy over the news-item filed by a Mizoram-based news reporter is over. We were now touched by the fresh news that Mary Kom could not control her tears while defending herself before the members of AMWJU at a special meeting between themselves to settle the controversial matter. Let her innocent tears lead her towards the golden dream that we all cherish for in the next Olympics at Rio in 2016. Mary, every sparkling drop of your innocent tears is precious. It stands for Ching-Tam unity and integration. We love you, Mary Kom. You are the darling daughter of Manipur. You are the inspiring hope of many a women across the globe. May our prayer be heard by the Almighty and lead you to a higher pedestal, symbolizing the spirit of Manipuri women before the entire world. This article was webcasted on November 11 2012.